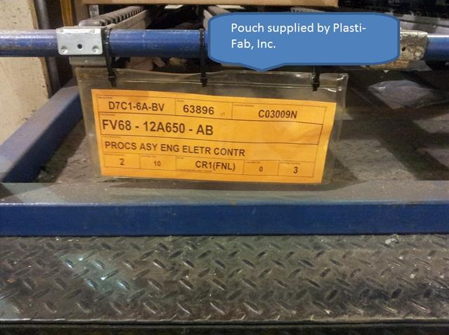 Plasti-Fab, Inc. offers high quality pouches. These pouches feature a clear vinyl front and various different backings. They are available in a variety of standard shapes and sizes. Pouches can be customized to fit all our client’s needs. Our pouches are produced using dielectric heat sealing. The pouches are made with a variety of clear and colored materials. The clear finish helps laminate and preserve different types of documents or printed materials. These pouches are easy to use, all you need to do is slide your document in to keep it protected. These pouches are often used for protecting things like badges, name tags, licenses, product specifications, photos, shipping tags and more. . The pouches may be produced with a full adhesive back or with strips of adhesive tapes, magnets or hook & loop velcro. Special holes can be perforated to allow room for added lanyards or chain attachments. Use our pouches to create durable documents. Preserve important information from dirt, tearing, debris, dust, liquids and other contaminants with our factory products. Different sizes to meet customer needs. Matte Pouches: To help reduce the glare we can use specific materials to give the pouch a matte finish. Adhesive-Back Pouches: These adhesive-backed pouches with a release liner work the same as labels. They can be used on a variety of surfaces. Magnetic Pouches: These magnetic back pouches are great for metallic surfaces. Pouches with Pre-Punched: The slot allows the pouch to be attached to a lanyard, plastic loop, badge clip, or zip tie. 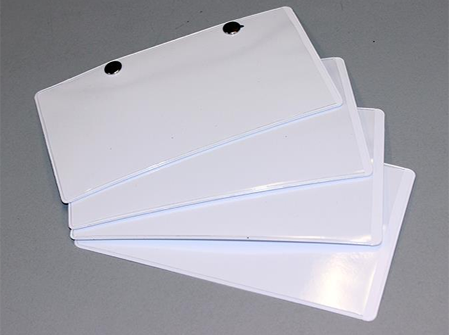 These pre-punched pouches are often used for tags and badges. Other names for our pouches in the market can be laminating pouches, ID pouches, badge holders, id holders or vinyl holders. Our heat-sealed pouch is ideal for the industrial, material handling, corporate, and retail industries. At Plasti-Fab, Inc. we can custom order tooling to meet our customer’s needs. If you are looking for a specific size pouch, please contact us and we will be glad to assist you.